In a really busy year, this month seems to have been the busiest of the lot; I’ve tried to be creative by combining as many entries to blog challenges as possible – regular readers will have spotted this from earlier posts. I think I’ve done pretty well, but there are two further challenges I want to enter: One Ingredient and Classic French. In addition, I needed to bake something from Eric Lanlard’s latest book Chocolat which I was recently sent for review. So how was I going to cover all three bases? With a few twists and turns, I used Eric’s take on the classic French Fruit Tart, but substituted his strawberries with raspberries. Rubbed 100g unsalted butter into 150g of flour (half wholemeal spelt, half white) and 2 tbsp vanilla sugar (golden caster) until the butter disappeared. Added a duck egg yolk and stirred it in to combine the mixture into a ball of dough. Put into a plastic bag and placed in the fridge for 1 hour. Rolled out on a floured surface and cut out circles to line six 9 cm tart cases, re-rolling as necessary. Baked at 180C for 10 minutes until golden. Melted 50g of vanillary white chocolate (G&B) in a bowl over hot water then left to cool a little. Whisked 150 ml double cream until peaks formed. Stirred a large tbsp of the cream into the chocolate then added the chocolate to the rest of the cream and stirred gently until just combined to make Chantilly cream. Spread about 1 tbsp of raspberry jam over the bottom of each tart case. Divided the Chantilly cream between the tart cases and spread it over the jam. Gently pressed some Cornish raspberries on top of the cream – a punnet’s worth. Waited patiently for the rain to stop so I could photograph the tarts in good light, but it didn’t, hence the photos with only two tarts, which were taken the next day. These tarts were perfect, each component was delicious in its own right, but combined together, they were pure ambrosia. I would have been happy to eat the pastry all on its own: it was buttery and crumbly and maybe I’ve finally overcome my pastry jinx. As for that Chantilly cream, it was a pure dream, as the Big Bopper might have sung and I shall be using it again for sure. The sun-kissed Cornish raspberries were the icing on the cake, so to speak. If this recipe is anything to go by, delving deeper into Chocolat will be a pleasure. I am entering these French Fruit Tarts into Classic French with Jen of Blue Kitchen Bakes. All rules are open to interpretation – I hope Jen will be generous and allow my entry. 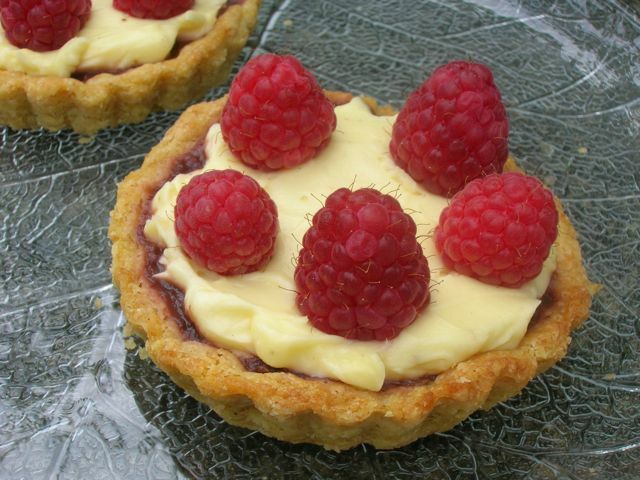 Nazima of Franglais Kitchen has chosen raspberries as this month’s One Ingredient and I’m very glad she did or I might not have made these thoroughly decadent raspberry tarts. This challenge is co-hosted by Laura of How to Cook Good Food. I’m also submitting these to Alpha Bakes with Ros of The More Than Occasional Baker and Caroline of Caroline Makes where the letter is R for Raspberries. Raspberries now being in season, I’m sending this off to Ren Behan’s Simple and in Season. And as these would be perfect for outdoor eating I am also submitting them to Four Seasons Food, co-hosted by Anneli of Delicieux and Louisa of Chez Foti. Those look delicious! Perfectly seasonal! These look lovely – I do so prefer raspberries with white chocolate compared to dark. Lovely Tarts, really delicious looking tart. I better try these. Fruit tarts are my favourite dessert ever. I buy mini ones when I am in Italy and these days they are easily available in the UK too. Of course they will never be as good as homemade ones. Raspberry and Chocolate work so well together. I know it is particularly good with white chocolate so am really glad to see this pairing for this month’s One Ingredient. I love mini tarts like this – a perfectly portable treat.